Polyfoam tunic is bright yellow and says Mustard! Conical yellow hat is conveniently clog proof! When you wield the power of mustard, you will be the mightiest condiment warrior in the fridge’s door shelf. No bun is safe from your tangy, yellow justice. You will add panache to every mayonnaise salad, compete with and annihilate your arch nemesis ketchup, and perfectly complement any corn dog or big, soft pretzel that dares to cross your path. And when the going gets really tough, you use your special move: the mustard water dribble. No one can resist the power of a little dribble of mustard water. It’s simply too...mustardy..and...watery. Mustard is recognized worldwide as the greatest condiment, ever. Unlike mayonnaise, it has no fat. Unlike ketchup, it has no sugar. Unlike hot sauce, it’s not too spicy. (Except for spicy mustard -- truly the best of both worlds.) Mustard is proof that the mustard gods love us and want us to be happy forever. Just don’t get any on your shirt, that’s a tenacious yellow stain. 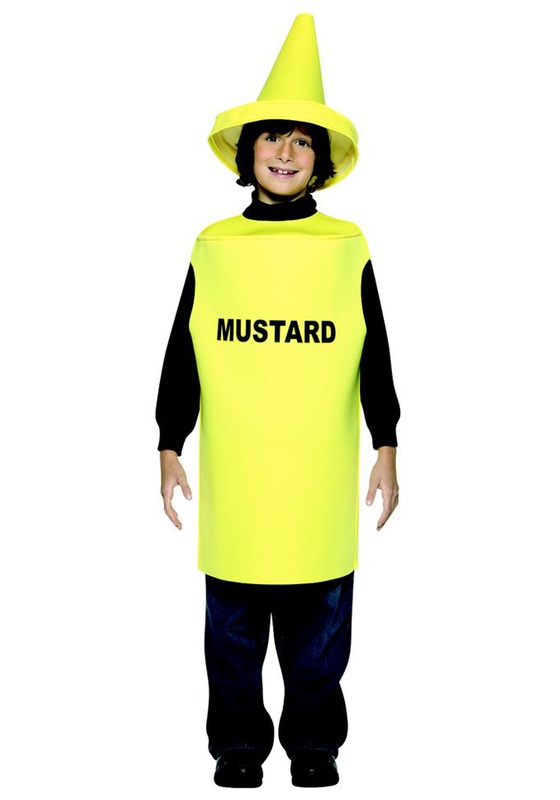 Our Mustard Costume is perfect for food-themed group costumes, anyone who appreciates the king of condiments in general, weddings, funerals, and draft board interviews. It comes with the tunic and hat pictured here, with the word “MUSTARD” written on the chest so people won’t think you’re a giant yellow crayon. Disclaimer: people might try to squeeze you when you wear this.